What can you do about it? Learn what options are available before open enrollment ends. Now that open enrollment is underway, we’re seeing big increases in health insurance premiums for 2017; they’re rising by an average of 25 percent among 38 states, according to a report released by The U.S. Department of Health and Human Services. HIGH COSTS GOT YOU DOWN? CHECK OUT THE NFIB HEALTH INSURANCE EXCHANGE, WHERE MEMBERS CAN FIND GUIDANCE AND SAVINGS, INCLUDING ALTERNATIVES SUCH AS NON-OBAMACARE PLANS. The report confirms what many have been speculating all along: Insurers are dropping out of insurance exchanges, and remaining companies are struggling to cover their costs, according to The Washington Post. The 25 percent increase is the steepest so far. Last year, premiums for the second-lowest-cost silver plans went up by 7.5 percent on average across 37 states, according to Bloomberg. Even former Pres. Bill Clinton has spoken out about how Obamacare has adversely affected small business owners. The Obama administration is predicting that 11.4 million people will pick health plans by the end of January—about 1 million more than the number of Americans with such coverage now, according to The Washington Post. The HHS report paints a dismal picture. And small businesses still can’t catch a break. Anthony Zurcher of BBC News, Washington, explains how this “protection” really doesn’t include everyone. One other item for owners to look out for: open enrollment, which started Nov. 1. 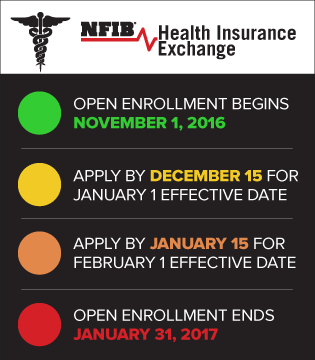 For more info about what that means for your small business, visit the NFIB Health Insurance Exchange hub.